The introduction of biofuels in Slovenia and the objectives in this area are lagging behind the referential values set out in the EU Directive on the promotion of the use of biofuels and other renewable fuels for transport. Slovenia explains the deviations from the referential values with the limited possibilities for biofuel production, the discrepancies between the prices of mineral fuels and biofuels and the burdening of biofuels with excise duties, which creates market conditions that do not stimulate consumers to use biofuels. This indicator shows the dynamics of biodiesel production and biofuel content in diesel fuel and gasoline in the period 2005–2008 in the Republic of Slovenia and the energy share of biofuels in total fuel consumption in transport in 1995 and 2006 in European countries. Biofuel is a liquid or gaseous fuel for the propulsion of motor vehicles, produced from biomass. In accordance with the Directive 2009/28/EC on the promotion of the use of energy from renewable sources, all EU countries must ensure that at least 10% of their transport fuels come from renewable sources by 2020.
at least 7.5% in 2015. In 2003, the European Parliament and the EU Council adopted the Directive on the promotion of the use of biofuels and other renewable fuels for transport (no. 2003/30/EC), introducing measures for such incentives to replace the use of diesel fuel and gasoline in transport. This is an important contribution to the realisation of objectives to improve the reliability of the energy supply, reduce GHG emissions and create new opportunities for sustainable rural development. The Directive has set requirements that the EU Member States provide a minimum share of biofuels and other renewable fuels in transport and, for this purpose, determine their national target shares of biofuels. For the EU Member States, referential values for national target shares of biofuels in transport have also been set as follows: 2% by the end of 2005, 6.5% by the end of 2013 and 7.5% by the end of 2010. Despite rather optimistic forecasts regarding the positive effects of biofuels, doubts about their use have recently been increasing. The production and use of first-generation biofuels (Agri Fuels) is especially controversial; namely, they might negatively affect the biodiversity and protection of water and soil and cause global changes in land use, increasing prices of food, etc. Therefore, attention is slowly being redirected to second-generation biofuels (waste, plant residues such as wood biomass, straw, grass, etc.) which, however, are poorly researched and their production, based on existing technology, is expensive (EEA, 2008). Considering the high prices of engine fuels and our increasing energy dependence, the EU has high hopes for biofuels, which would, together with other renewable energy sources, represent 10% of the energy mix by 2020 (EEA, 2009). The Operational Programme for Limiting Greenhouse Gas Emissions, the amendments to which were adopted by the Government of the Republic of Slovenia in 2006, represents the starting programme document of the Republic of Slovenia for the introduction of measures to promote the use of biofuels in transport (Ministry of Environment and Spatial Planning, 2011). The Excise Duty Act (Official Gazette of the Republic of Slovenia, No. 02/2007) stipulates that biofuels shall not be subject to excise control and the payment of excise duties if used as engine fuels in their pure form. When mixed with fossil fuels, exemption from payment of excise duties can be claimed up to a maximum of 5%. Unfortunately, this exemption was abolished by the Government in 2014. The Decree on the promotion of the use of biofuels and other renewable fuels for the propulsion of motor vehicles (Official Gazette of the Republic of Slovenia, No. 103/2007) specifies, in accordance with EU Directive no. 2003/30/EC, the types of biofuels used in transport and the shares of annual amounts of biofuels marketed in the Republic of Slovenia for the propulsion of motor vehicles. In accordance with the provisions of Articles 5 and 6 of this Decree, distributors of fuels for the propulsion of motor vehicles in transport must ensure that the annual average content of marketed biofuels in all fuels for the propulsion of motor vehicles in Slovenia is equal to at least 2% in 2007, at least 3% in 2008, at least 4% in 2009, at least 5% in 2010, at least 5.5% in 2011, at least 6% in 2012, at least 6.5% in 2013, at least 7% in 2014 and at least 7.5% in 2015. The estimated shares of biofuel consumption referred to in Directive 2003/30/EC have not been achieved, as there are no refineries for the production of motor gasoline in Slovenia; biofuels appropriate for mixing with motor gasoline are also not produced. Biofuels in the Republic of Slovenia were being experimentally mixed into diesel fuel intended for the propulsion of motor vehicles in road transport by 2004. The added biodiesel in diesel fuels was partly imported from third countries, produced in other EU Member States or partly produced in Slovenian plants for the production of vegetable oil (Ministry of Agriculture and Environment, 2012). In June 2005, Ljubljana Passenger Transport (LPT) began testing a mixture of petroleum-based diesel (80%) and biodiesel (20%) in two of its buses. However, they switched to 100% biodiesel (used in up to 20 buses) in 2006 due to difficulties involving fuel storage. In March 2009, the LPT abandoned the use of pure biodiesel in all of its buses, as it proved to be uneconomical. In 2011, the LPT added 20 new buses powered by methane to its fleet, thus contributing considerably to reducing emissions of certain air pollutants, especially fine particulates in exhaust gases (Ministry of Agriculture and Environment, 2013). The number of methane-powered vehicles in the LPT has been increasing constantly. Technologically, Slovenia is most suited for the production of biodiesel or pure (raw) vegetable oil as an alternative engine fuel. Basic raw material for their production is oil obtained by cold pressing of rapeseed or sunflower seed. In order to obtain biodiesel from oil, a further process of vegetable oil esterification is required; imported raw material or that produced on Slovenian agricultural land can be used for this process. In the future, the majority of planned production of biodiesel will be based on imported raw materials; namely, according to estimates made by the Ministry of Agriculture, Forestry and Food, only a maximum of 6,000 to 7,000 hectares of land in Slovenia would be appropriate for the production of rapeseed (Ministry of Environment and Spatial Planning, 2011). In 2010, rapeseed growing land in Slovenia was almost three times larger than in 2005. In 2010, it was produced on 6,464 hectares, yielding 15,518 tonnes of rapeseed, which allowed production of slightly more than 5,000 tonnes of biodiesel. In 2013, the rapeseed growing land amounted to 6,131 hectares. Biodiesel was produced by a single registered producer who, in 2012, produced 20,561 tonnes of biodiesel from rapeseed originating from agricultural land in Slovenia, while imported oil was used as well. In 2013, the same registered producer produced only 1.7 tonnes of biodiesel – from imported oil. 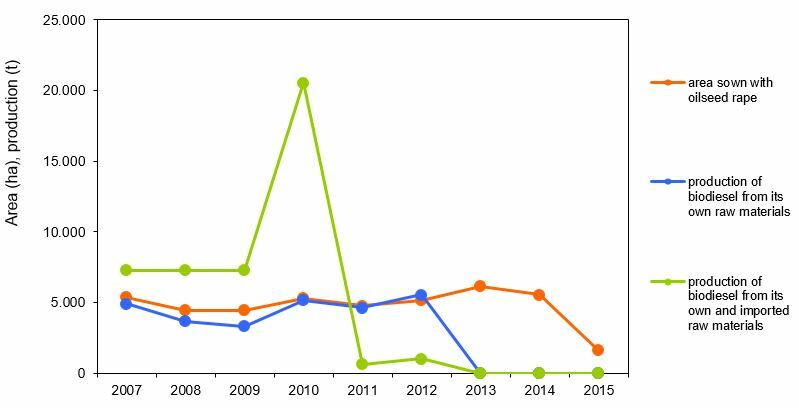 In 2014 and 2015, the only producer of biodiesel entirely abandoned production for economic reasons. 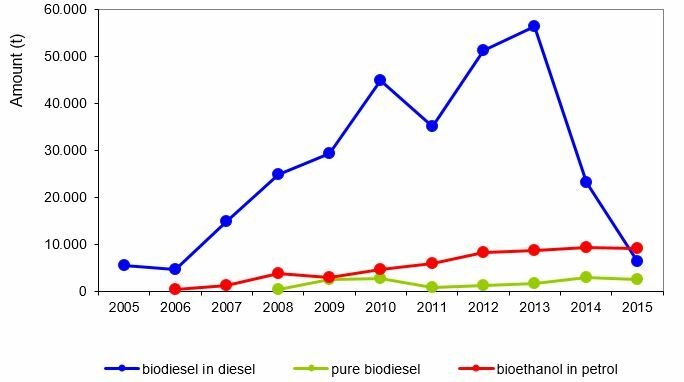 In recent years, production of biodiesel in Slovenia has been relatively modest given the production capacities. According to producers, this is a consequence of conditions/prices on the market of mineral/fossil fuels and biofuels. in 2015: biodiesel in petrol-based diesel 250 t (0.44%), pure biodiesel 2,521 t, bioethanol in petrol 9,145 t (2.12%). 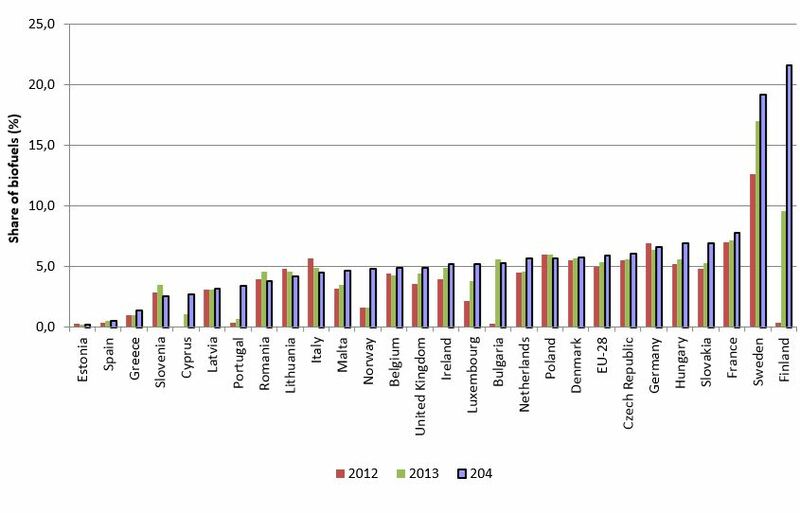 In 2011, the share of biofuels in transport was rather low in the EU-28 (3.4%). In recent years, it has grown considerably, to 5.9% in 2014. The greatest change was observed in Finland, where the share of biofuels in transport increased from 0.4% in 2011 to 21.6% in 2014. Estonia has the lowest share of biofuels in transport: in the period 2011 – 2014 it remained constant, at 0.2%. At the end of 2009, trial biodiesel production began in Slovenia at a new plant with the annual production capacity of approximately 50,000 tonnes. This stimulated the production of plants suitable for biodiesel production. According to its short-term plan, the plant intended to produce 25,000 tonnes of biodiesel per year. Imported oil, waste cooking oil and animal fat were to be used as raw material, along with smaller quantities of seeds (mostly rapeseed) produced in Slovenia. As already mentioned, however, expectations of the production of biodiesel in Slovenia were not met and production was terminated in 2013.